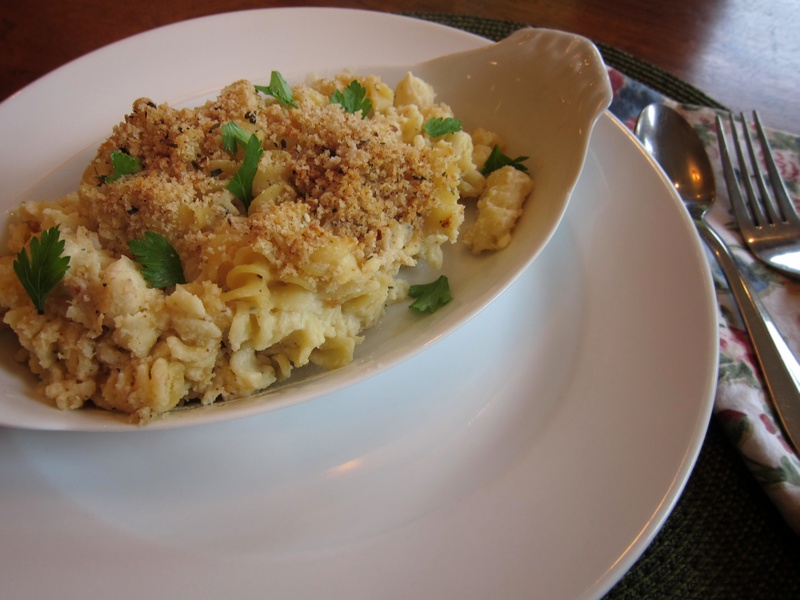 I’ll be willing to bet Mac & Cheese is near the top of the list when it comes to comfort food favorites! You can make it with gourmet cheeses and luxe add-in’s like truffle, or keep it simple and familiar with an “all cheddar” approach. My offering is a midway point between fancy-pants and kid stuff. Boil the pasta in lots of salted water until tender, about 10-12 minutes. Drain and set aside. Grate your cheese and set aside. Melt the butter over medium low, add the flour and whisk briskly. Add the nutmeg and parsley. Cook for a couple of minutes, whisking constantly. Tip: I’m using the pot i’ve boiled my pasta in, no need for more dishes, right? Add the milk slowly, whisking. Make sure to scrape the bottom and sides of the pan. The sauce will take a few minutes to thicken. Off the heat, add the cheese a handful at a time, stirring to incorporate between handfuls. Add the cooked pasta to the cheese sauce and fold gently until well combined. Pour into a buttered casserole or gratin dish. To make the crumb topping mix the melted butter and the bread crumbs, stir gently until all the crumbs are saturated with butter. Sprinkle over the top the mac & cheese. Allow to cool for about 10 minutes before serving.